Our Laundry Powder is a revolutionary approach to laundry care. It does not cover up stains and odors with scents and brighteners - it really cleans. It is made with a unique blend of biodegradable coconut-based detergents and high-grade, completely soluble, Green River washing soda. I have been using Charlie's Soap for the past couple of weeks, and the difference in the appearance of my families cloths is incredible! Our cloths are softer, more vibrant, and have a crisp and fresh scent. Charlie's has rejuvenated our clothing (lifting old stains & fading), the colors are more brilliant, and the whites are definitely brighter! I love that this soap is all natural and safe for use with my children and myself, who all have sensitive skin. A small amount goes a long way with Charlie's...making the cost of each load just pennies to clean. 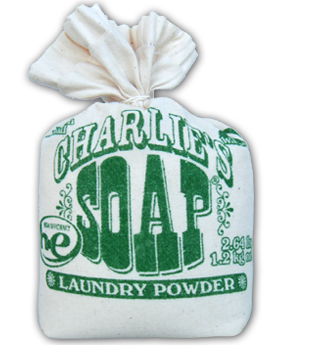 As my family searches constantly for greener alternatives to products that we have used in the past, Charlie's Soap offers wonderful options for both household & Laundry cleaning. The result of using Charlie's Soap is sure to impress! My Thanks to Charlie's Soap for providing the product for review. Charlies Soap is being very kind to offer 1 Lucky reader a 80 Load Package of their natural Laundry soap & a bottle of Stain Remover! Leave a comment~ Which Charlie's Soap Product are you most excited to try, and why? The Comment is considered your entry. Entry to this giveaway ends at 12pm PST JUNE 20, 2010. Winner's are chosen randomly through random.org. The winner will be announced on the top of this post, and contacted through email. The winner will have 48 hrs. to respond or another winner will be chosen. I have heard great things about Charlies but have never used it myself, I would be excited to try ANY of their products! The stain remover sounds great! I follow you via twitter! I entered the ipad giveaway! I would love to try the laundry soap because I've heard it is Great for cloth diapers, and with 2 kids in cloth - I need something that works well consistently! i'd love to try the all purpose cleaner. does it work on grubby kids, i wonder...? I would love to try the laundry soap!! I also entered the ipad giveaway! I entered the ipad giveaway!! I'd most like to try the laundry powder. I like that it doesn't leave any residue since my kids both have very sensitive skin. I tend to be clumsy and get a lot of food on my clothes so the stain remover sounds awesome! Thanks! Hello, I would be most excited to try the liquid laundry detergent, but if you are refering to the prize it would be the detergent. Thanks for a great giveaway. definitely the laundry soap and stain remover!! I'm all for trying something new. I think I would prefer to try the liquid detergent. Don't much care for powdered. I'm following you from MBC and would love to have you follow me! I added your blog button to my blog. Look on the left under Blog Reads. That is a really tiny button. I'm now following you on twitter. Entry 2: I'm now following you on twitter. Entry 3: I'm now following you on twitter. Entry 4: I'm now following you on twitter. Entry 5: I'm now following you on twitter. Entry 2: I added your blog button to my blog. Look on the left under Blog Reads. That is a really tiny button. Entry 3: I added your blog button to my blog. Look on the left under Blog Reads. That is a really tiny button. Entry 4: I added your blog button to my blog. Look on the left under Blog Reads. That is a really tiny button. Entry 5: I added your blog button to my blog. Look on the left under Blog Reads. That is a really tiny button. Entry 6: I added your blog button to my blog. Look on the left under Blog Reads. That is a really tiny button. Entry 7: I added your blog button to my blog. Look on the left under Blog Reads. That is a really tiny button. Entry 8: I added your blog button to my blog. Look on the left under Blog Reads. That is a really tiny button. Entry 9: I added your blog button to my blog. Look on the left under Blog Reads. That is a really tiny button. Entry 10: I added your blog button to my blog. Look on the left under Blog Reads. That is a really tiny button.